Mount Billy Conservation Park was my last activation for the 3 days away. 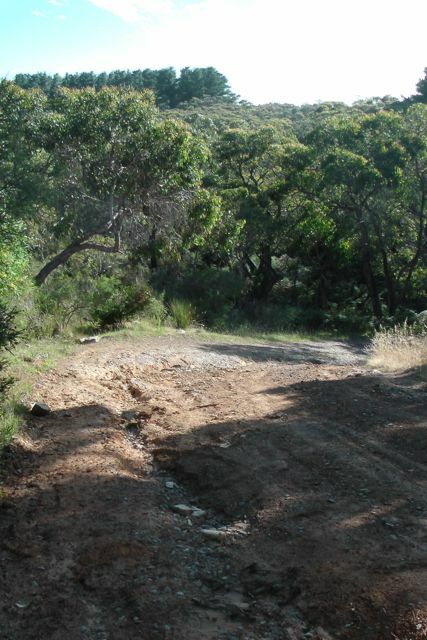 It is just a few km south east of the Spring Mount Conservation Park, off the Hindmarsh Tiers Road. 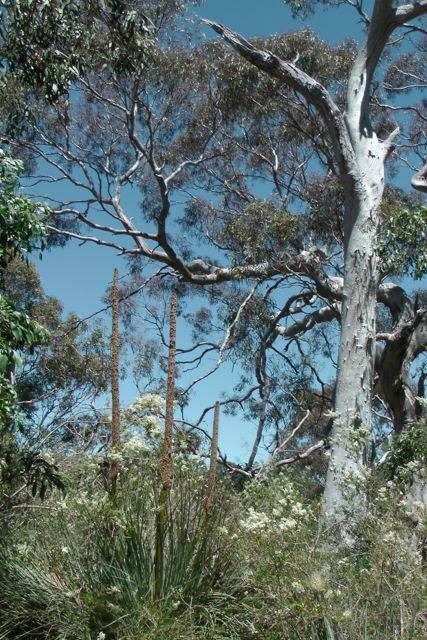 Mount Billy Conservation Park is 199 hectares in size and represents some of the best preserved mallee and forest within the southern Mount Lofty Ranges. The Hindmarsh Valley Reservoir can be located on the southern side of the park. The Mount Billy summit is also located in the southern section of the park (sadly not a SOTA summit). I have not been able to find a reference as to how the park/summit was named. 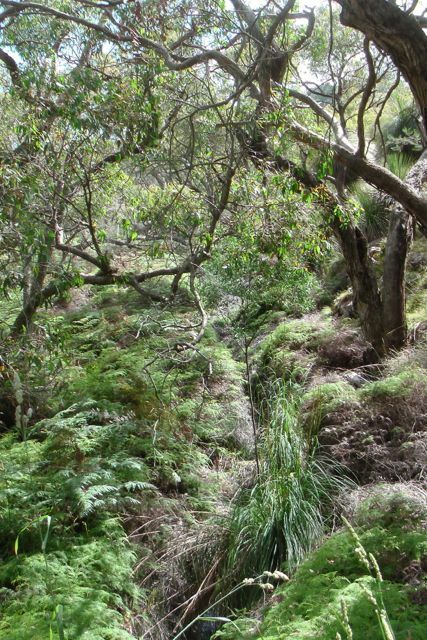 The thick under storey of the park and the many creek lines provide habitat for numerous bird and animal species including the endangered Bassian Thrush, Chestnut-rumped Heathwren and the rare Southern Brown Bandicoot. The Heath Goanna can also often be spotted, basking in the sun. 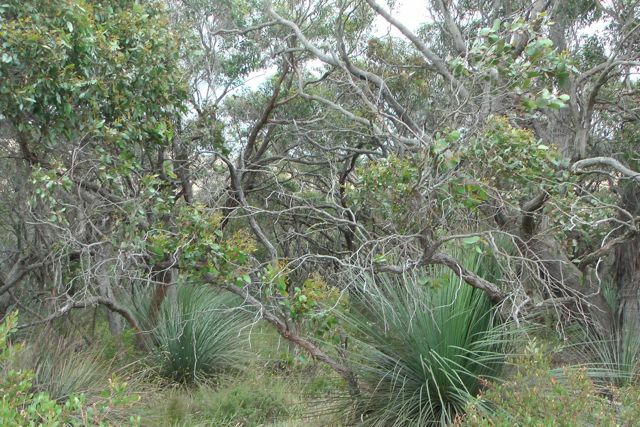 The scrub within the park is very thick, but there are two trails which takes you around the park: Banksia Hike (2.6 km), and the Mount Billy Hike (4.7 km). 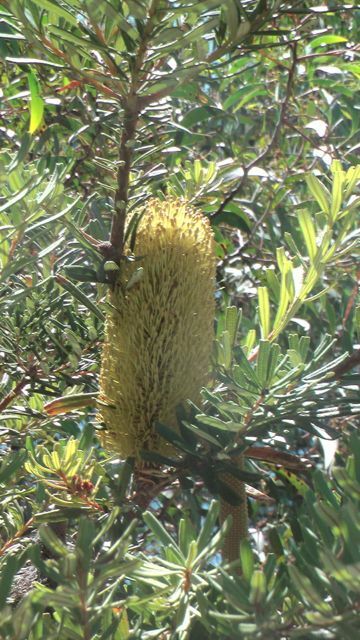 Many of the native plants were out in flower whilst we were in the park, including a number of the Banksia species. 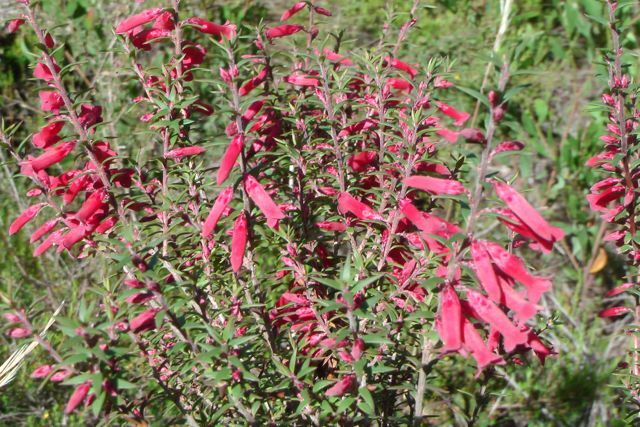 The park is full of Pink Gum, Blue Gum, Cup Gum, and Woodland Sheoak. During spring, flowering orchids are found on the forest floor. 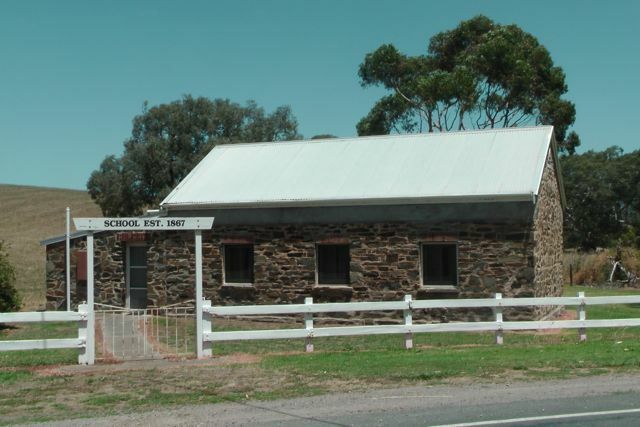 Just down the road from the park is the old Hindmarsh Valley school building which was established in 1867. It is a beautiful old building and well worth stopping to have a look. We found a nice operating spot, just inside the park gate on the Hindmarsh Tiers Road. There was plenty of room to set up the table and chair, and extend the legs of the dipole. The only down side were the large sand ants. They pack a bite with a lingering sting, as I found out. 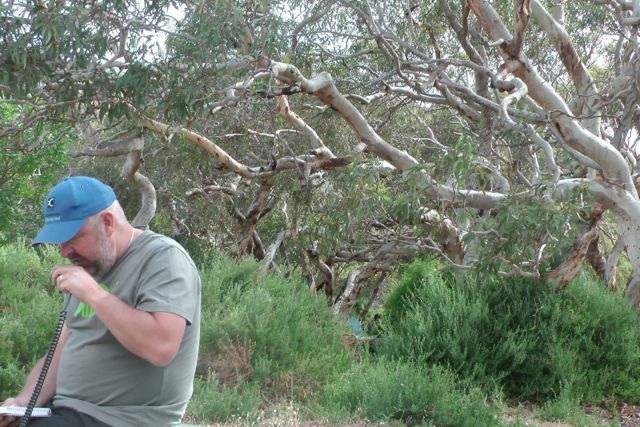 My first contact in the park was with Graham VK5KGP at nearby Victor Harbor, followed by Larry VK5LY in the Riverland, and Col VK5HCF operating qrp 5 watts, and Tim VK5AV from the south east. 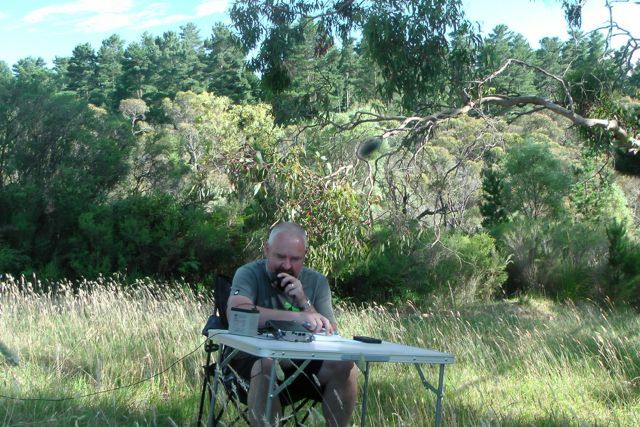 Ian VK5CZ who was portable in Wirrabra Forest on his Elecraft KX3, came up to say goodmorning. Greg VK2FGJW/1 called in again from SOTA peak, Black Mountain, VK1/ AC-042. I think Greg may have been infected by the deadly SOTA bug. Because the noise floor in the majority of the parks is non existent, you can work the weakest of stations. So it is always pleasing to get some calls from QRP stations. 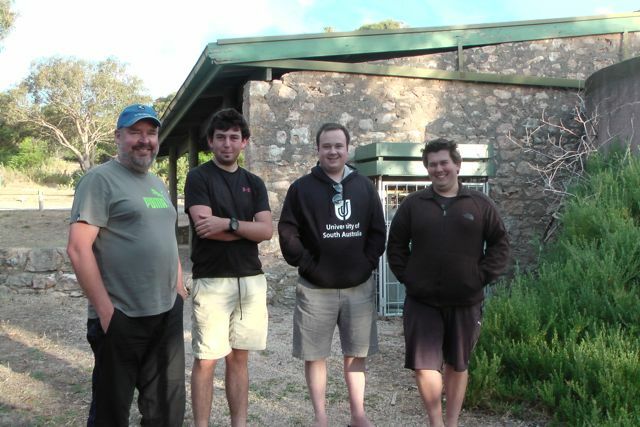 In Mount Billy I worked Col VK5HCF, Luke VK3HJ, and Ian VK5IS, all of whom were using QRP 5 watts or less. I managed a few more interesting QSO’s including Kevin VK3KAB who was portable on SOTA peak Trapyard Hill,VK3/ VT-005, Andrew VK3BQ who was in Mount Kosziusko National Park, and Steve VK3JY who was operating QRP with his Elecrat KX3, from his holiday home at Lake Eildon. Unfortunately Steve was just outside the boundary of the National Park. I felt a bit guilty that I had run our of time to try 20m from the previous park (for some of the further afield VK’s who chase Parks), so I headed over to the 20m band hoping to get some further afield VK’s. I called CQ for a while but there were no takers. So I tuned across the band which was virtually empty, except for Peter VK3ZPF who was calling CQ from SOTA peak, Mount Matlock, VK3/ VC-001. After speaking with Peter, I was called by Dennis VK4SX, and Stu VK4SDD, both of who had great 5/9 signals coming in from Queensland. 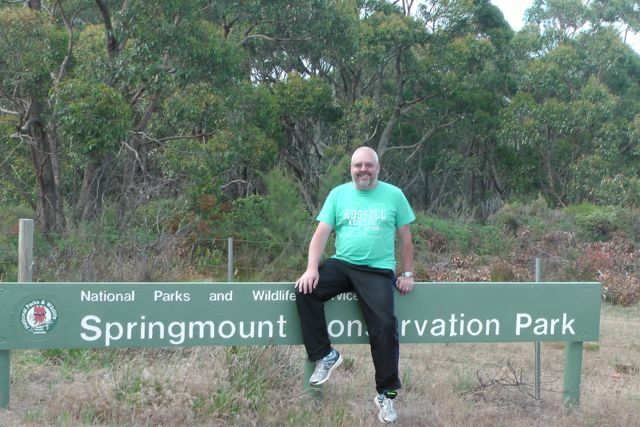 My first activation for Sunday 29th December, 2013, was the Spring Mount Conservation Park, which is situated about 24 km north west of Victor Harbor, and about 71 km south of Adelaide. Marija and I headed out relatively early again after breakfast in the motel room. This was our departure day and back to ‘reality’. We had both really enjoyed our stay down at Victor Harbor, and the Comfort Inn is recommended. Marija and I headed north out of Victor Harbor and then turned left onto the Hindmarsh Tiers Road, through the beautiful dairy country of the Hindmarsh Valley. We then turned left into Spring Mount Road which offered spectacular views out to the ocean. On the western side of Springmount Road there is a cleared area between the fence line and the scrub. It was the ideal spot to set up the station. We set up the foldable table & deck chair and erected the 40m/20m dipole with use of the 7m squid pole. My first contact of the morning was with Parks stalwart, Larry VK5LY, followed by Col VK5HCF running QRP 5 watts, Brian VK5FMID, and Nev VK5WG who was also running QRP. This was followed by a steady flow of callers from VK1, VK2, VK3 & VK5. The band seemed to be in very good shape. 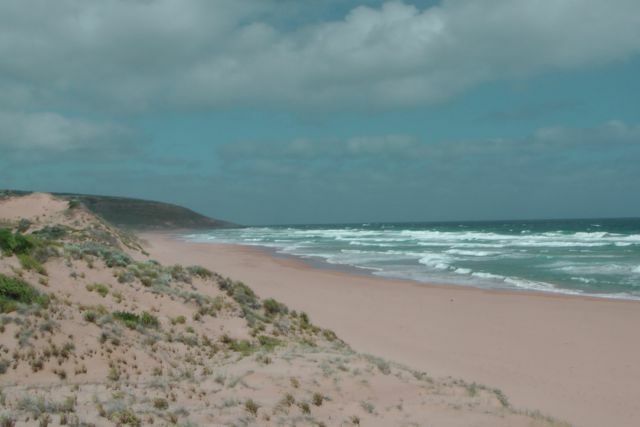 One of my QRP to QRP contacts was with Richard VK5ZRY who was operating with just 1/2 watt from Port Vincent on the Yorke Peninsula of South Australia. Greg VK2FGJW/1 called in to say hi. 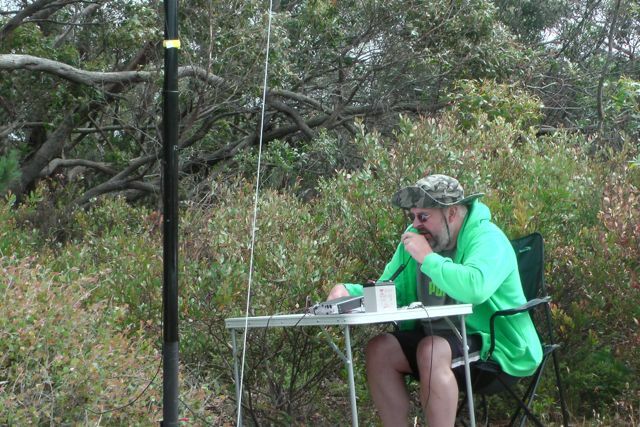 He was portable on Black Mountain in the ACT, using QRP 5 watts from his Elecraft KX3, and a dipole. After some discussion with Greg about the Summits on the Air program, it was confirmed that Greg had indeed qualified for SOTA from his portable location. I believe this was Greg’s first ever SOTA activation. My last contacts of the day were with Joe VK3YSP and Julie VK3FOWL who were on the Christmas trip and were portable in the Little Desert National Park in western Victoria. Whilst I was operating, I had some regular visitors. But not humans ! They were little Superb Blue Wrens. The male of the species has a really striking bright blue plumage on its head, neck, and tail. They are an active and gregarious little bird. 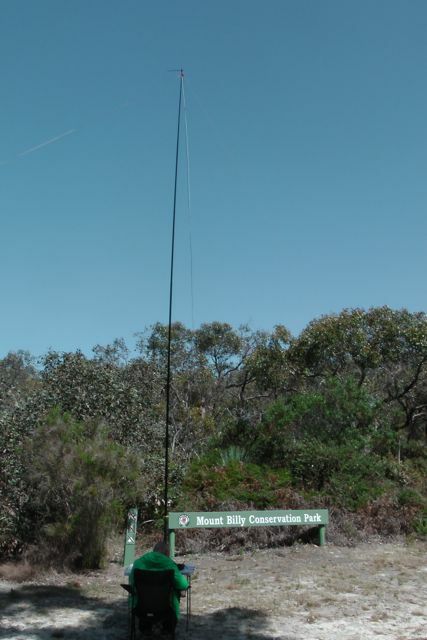 Conditions on 40m SSB were really good, but I was already behind schedule, so we packed and headed off to the final park, the Mount Billy Conservation Park. Larry VK5LY; Col VK5HCF; Brian VK5FMID; Nev VK5WG; Graham VK5KC/p; Tom VK5EE; Tim VK5AV; Graham VK5KGP; Chuck VK2SS/p; John VK5NJ; Len VK3FB; Rick VK5FIVE; Tom VK5FTRG; Ian VK5IS; Shaun VK5FAKV; Allen VK3HRA; Richard VK5ZRY; Tony VK3CTM; Ian VK5CZ/p; Greg VK2FGJW/1; Joe VK3YSP/p; and Julie VK3FOWL/p. 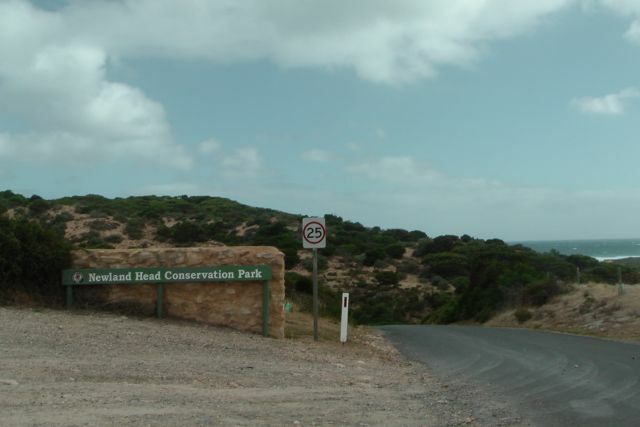 My final activation of the day was the Newland Head Conservation Park, which is situated on the southern coast of the Fleurieu Peninsula, about 7 km south west of Victor Harbor, and about 91 km south of Adelaide. Newland Head CP is a large park and consists of 1,036 hectares. It takes its name from the rugged headlands that shelter the associated two long beaches, Waitpinga Beach, and Parsons Beach, which are a popular destination for surfers and fishers. In fact my son Jake surfs here, as did I back in my ‘glory days’. Now if I ventured onto the beach, Greenpeace would be trying to roll me back into the water. Fishing is very popular as the wave action and gutters near the shore create ideal conditions for salmon, mulloway and mullet fishing. 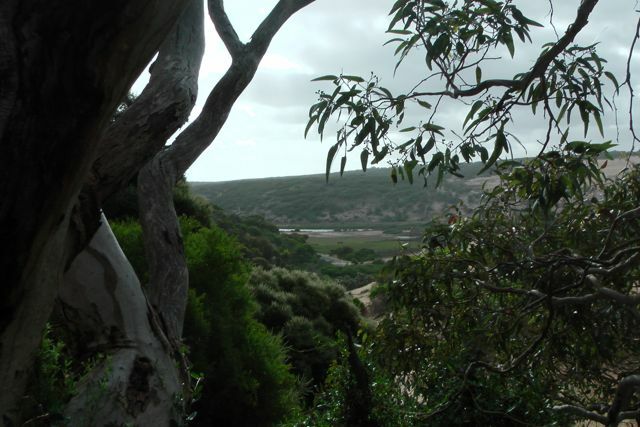 Part of the famous Heysen Trail, which extends for 1,200 km, runs through the park. The park is home to a large amount of birdlife including the Beautiful Firetail finch, Purple-crowned Lorikeet, Wedge tailed wage, Sining honeyeater, and White-capped Albatross. Southern Right Whales are frequently seen behind the surf zone or swimming towards the west. After breeding in the warmer waters of southern Australia they return to the main feeding grounds of the subantarctic where they feed in preparation for the return journey. Marija and I initially checked Waitpinga Beach with a view to erecting the vertical antenna in the sand, but it was extremely windy and too exposed. So we headed back into the Waitpinga campground and put up the gear alongside Dennis Hut, which was is an old stone hut built in 1890 by the Dennis family who lived in the area. 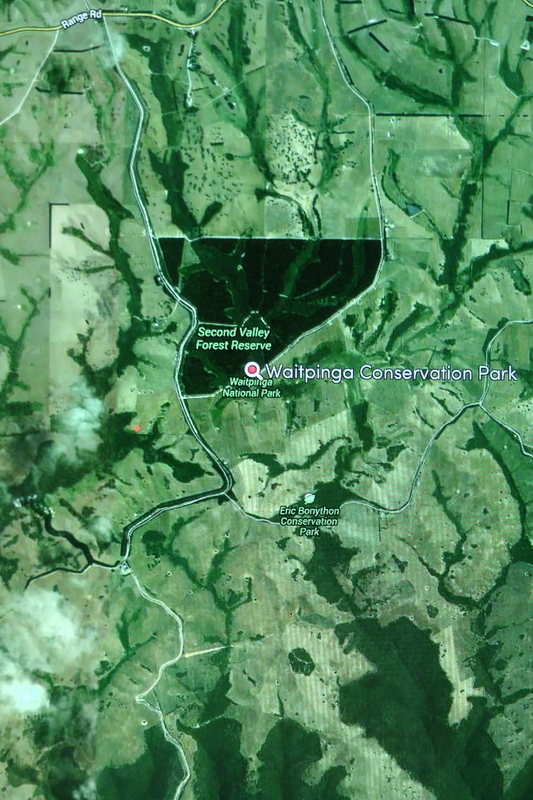 The Waitpinga camp ground is the only campground in the Park. 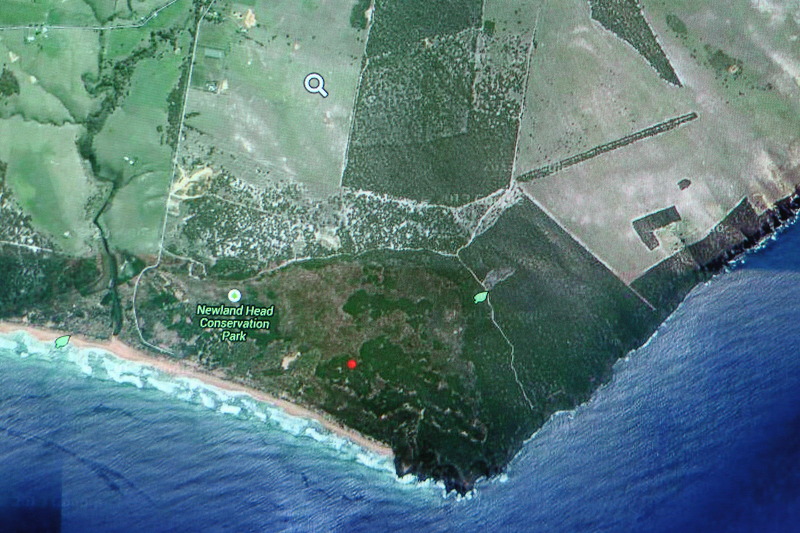 It is only about 750 metres inland from Waitpinga Beach, but is well protected from the wind off the Southern Ocean. The local aboriginal word for Waitpinga is ironically, ‘windy place’. 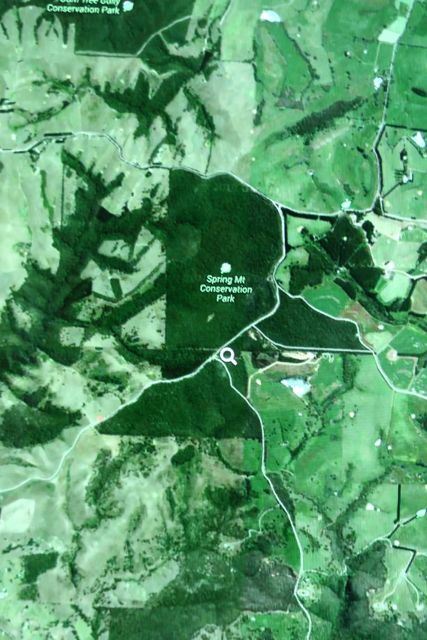 There are several walking trails which commence from the eastern end of the Waitpinga campground, which was full of campers, who became interested onlookers. Right alongside of the hut is a wooden table which was the ideal place to place the radio on and initiate as the ‘shack’. 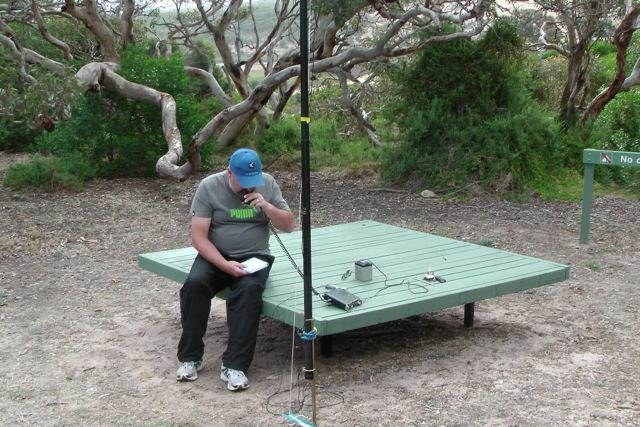 My first contact was again with Larry VK5LY from the Riverland, and this was followed by Tim VK5AV in the south east of S.A., and then Nev VK5WG from Crystal Brook, followed by Ian VK5IS. I even snuck in a Victorian National Park, with Marshall VK3MRG operating portable from the Lake Eildon National Park. After working a total of 15 stations on 40m it went very quiet. So I tuned across 40m and other than Urey VK3ATA calling CQ DX, there was not a single VK station on the band. I could also hear some Europeans coming through, but their signals were very low down. So I decided to head over to 20m to try my hand. And my first QSO was with Renzo P29FR. I am trying my luck at QRP DXCC, and Papua New Guinea was a new QRP country for me. So I was really happy to get Renzo in the log (5/8 sent and 5/4 received). My next DX QSO was with Tom DJ7ZZ. Unfortunately QRM made it very difficult for Tom (5/8 sent and 5/4 received). And my 3rd DX contact was with Franc F5PAU who had a very strong signal (5/9 sent & 5/2 received). But I think the highlight was my last QSO of the day, and that was with Anthony VK3YSA/ZL. Anthony was operating QRP with just 3 watts from an FT-817 and an end fed vertical. And he was in a Conservation Park, south of Dunedin. Signal reports of 5/3 both ways were exchanged. Whilst I was operating I had quite a few interested onlookers. In fact about one dozen people came up, curious as to what I was up to. This included 3 young guys (one was a pilot) who were involved with UHF radio. 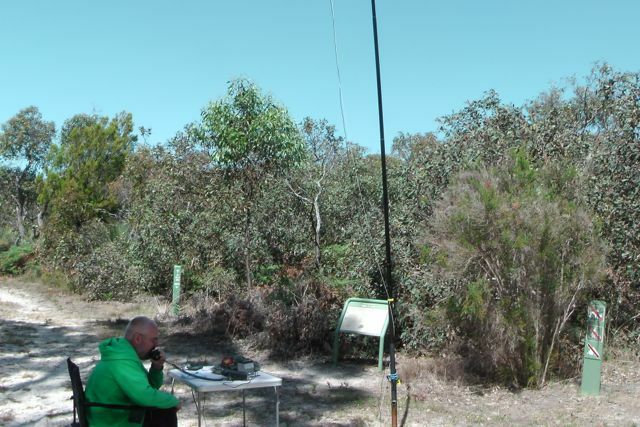 After a few enjoyable hours of radio, chatting, and a bit of bushwalking in Newland Head CP, I had a total of 24 contacts in the log on 40m SSB and 20m SSB. This was a really enjoyable activation with quite a few highlights for me. Larry VK5LY; Tim VK5AV; Nev VK5WG; Ian VK5IS; Graham VK5KGP; Tom VK5EE; Barry VK5BW; Marshall VK3MRG/p; Peter VK2NEO; Allen VK3HRA; Col VK5HCF; John VK5DJ; Rod VK5VRB; Hans VK5YX; Don VK2HUH; Renzo P29FR; Tom DJ7ZZ; Roy VK7ROY; Don VK7DON; VK6LCK; VK2HAS; Mark VK6AR; Frank F5PAU; & Anthony VK3YSA/ZL (qrp). 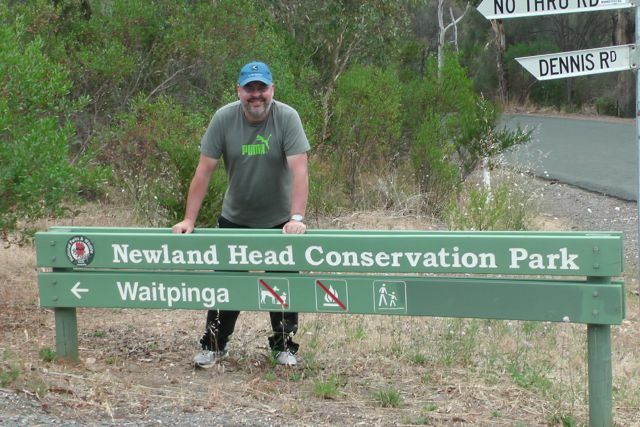 Following our activation of Waitpinga Conservation Park, Marija and I continued south on the Tunkalilla Road and then turned left into Rymill Road, until we reached our next destination….the Eric Bonython Conservation Park. Again, as is the case with Waitpinga CP, this is a small park and consists of just 6 hectares. 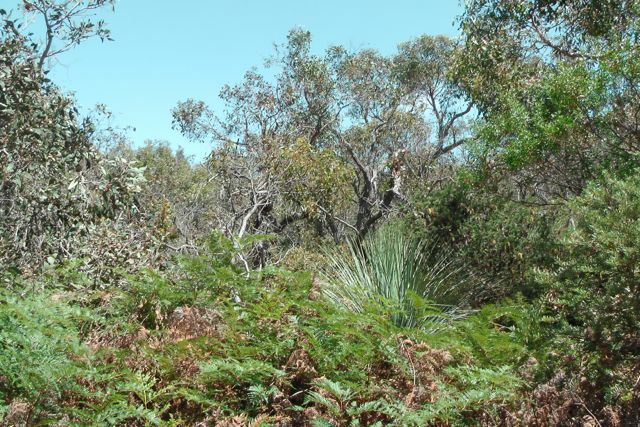 Although small it is an excellent example of what the vegetation was like on the Fleurieu Peninsula prior to the arrival of the Europeans and the destruction of the bush. I was not able to find a lot of information on this park on the internet. 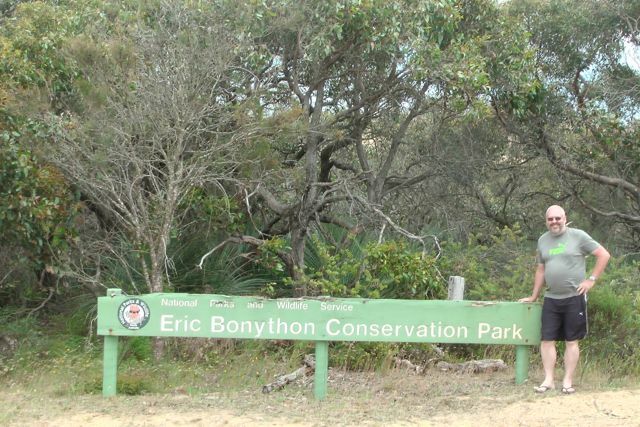 I presume it was named after Eric Bonython, the author ? The scrub in the park was very thick. There were no visible cleared areas of land at all. 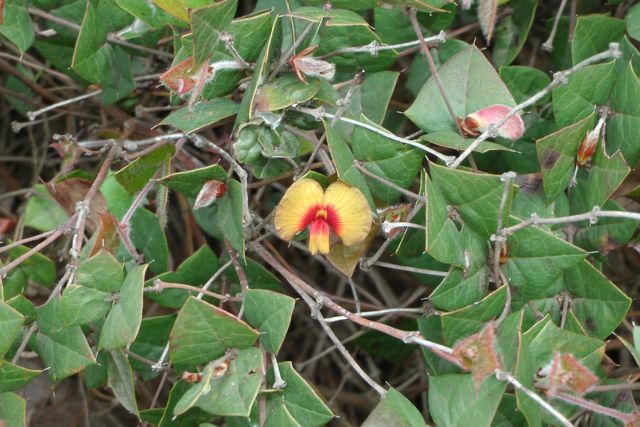 A large number of the native plants were out in flower. We set up the gear just off the side of the road as it was physically impossible to get into the scrub, and just too risky with the ‘Joe Blakes’ (snakes). We stretched out the legs of the dipole and ran them along in the direction of the dirt road, and secured the squid pole with the squid pole holder and an octopus strap. 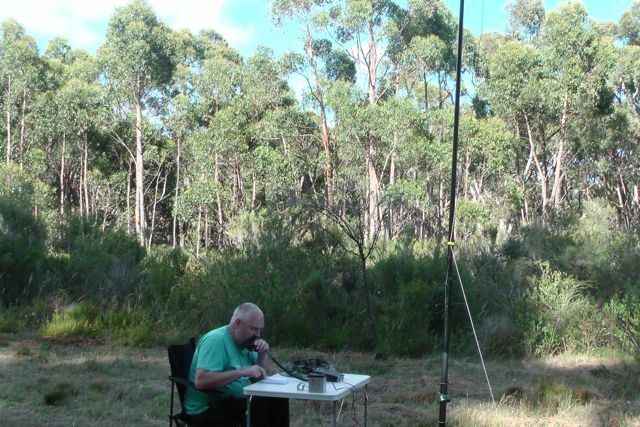 My first contact was with Col VK5HCF who was up at the South East Radio Club clubrooms, Mount Gambier, using his normal QRP 5 watts. Col had a great 5/9 signal. This was followed by Tim VK5AV, also from the south east of South Australia, Graham VK5KGP from Victor Harbor, and Nigel VK5NIG in the north eastern suburbs of Adelaide. I had a steady flow of callers after this, but sadly the weather had really deteriorated. The cloud cover had moved in, the sun had disappeared, and the wind was extremely strong. In fact it was so strong that the 7m telescopic squid pole, de telescoped twice during the activation. I managed another contact with Marshall VK3MRG in the Lake Eildon National Park, and one SOTA contact with Brian VK3MCD who was portable on SOTA peak VK3/ VU-011. The weather was just that lousy that it was not enjoyable sitting out there, so it was time to pack up. 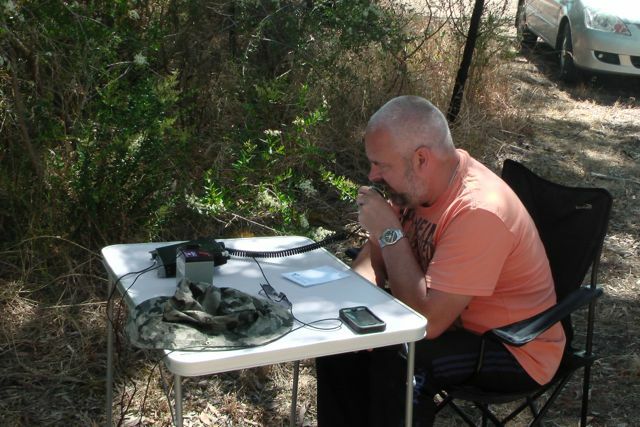 I had qualified the park and had a total of 17 QSO’s from VK3 & VK5 in the log. Col VK5HCF; Tim VK5AV; Graham VK5KGP; Nigel VK5NIG; Marshall VK3MRG/p; Tom VK5EE; Norm VK5GI; Tom VK5FTRG; Nev VK5WG; Brian VK3MCD/p; Barry VK5BW; Barry VK5BAR; Allen VK3HRA; Ian VK5IS; Bernard VK3AMB; Ian VK5CZ; Nick VK3ANL. 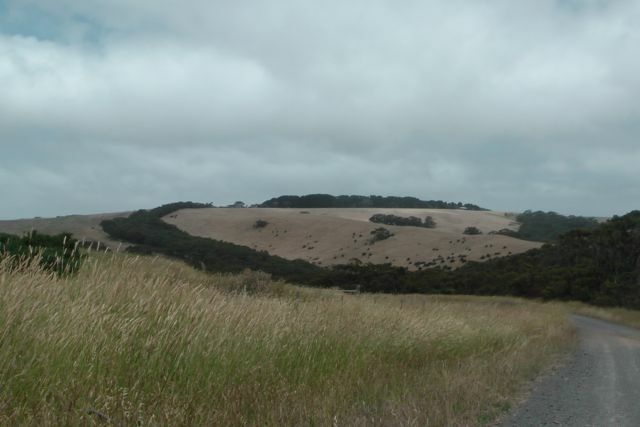 My first park activation for Saturday 28th December, 2013, was Waitpinga Conservation Park, which is about 40 km west of Victor Harbor, on the Fleurieu Peninsula, and about 113 km south of Adelaide. Marija and I had another early start from Victor Harbor and headed out west along Range Road, through the beautiful dairying district of Parawa. There are sensational views out to both the north and the south from Range Road. 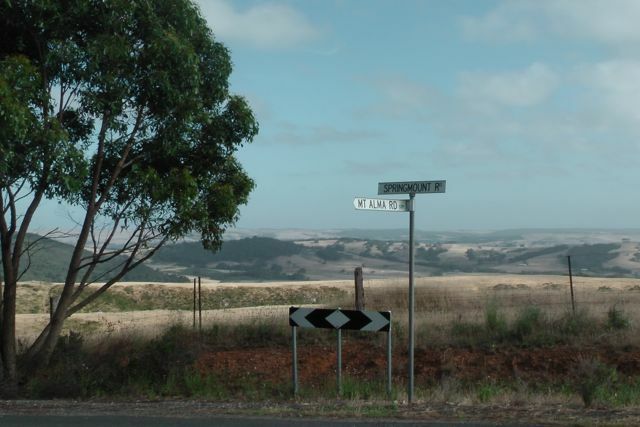 Out to the north are the rolling hills and valleys of the Fleurieu and out to the south is the Southern Ocean. We then turned left onto Tunkalilla Road and headed towards the coast and Tunkalilla Beach, before turning left onto Illawong Road. We reached a point on Illawong Road, where we just could not go any further in Marija’s Mitsubishi Lancer. The road was quite steep and was severely washed away in significant places. It just wasn’t worth risking getting stuck. 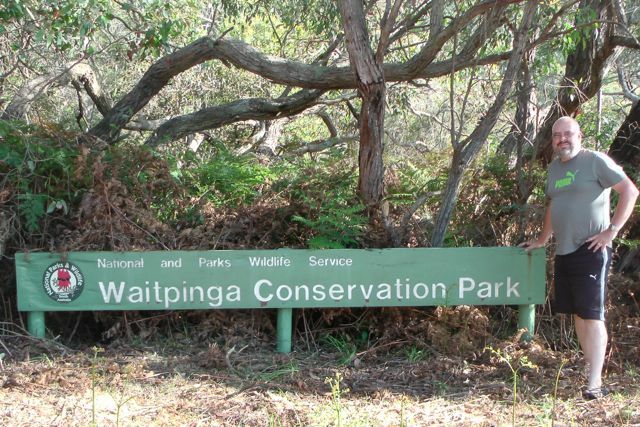 The Waitpinga Conservation Park is only a small park, which is about 3 hectares in size and is dedicated to the conservation of the rare Coral Fern. 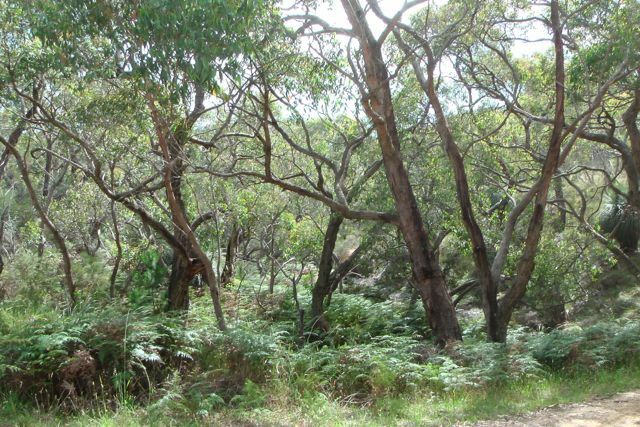 The park consists of low open forest of stringy bark and Pink Gum, over an under storey of bracken, tea-tree, sedges and grasses. The vegetation within the park is very thick. Many of the native plants were out in flower during our visit. 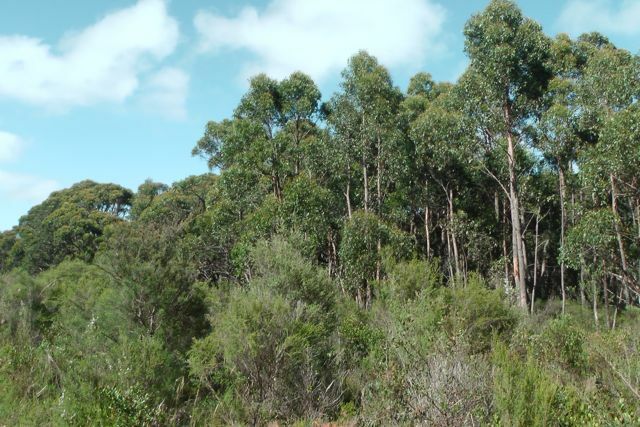 The park is located on the northern side of Illawong Road, and backs onto a pine plantation. It is quite some distance away from the beach known as Waitpinga Beach. Waitpinga in the local aboriginal language means ‘windy place’. And it was windy where we decided to set up. Despite it being a warm start to the day, a cool change was coming in quickly and the wind off the Southern Ocean was really starting to pick up. 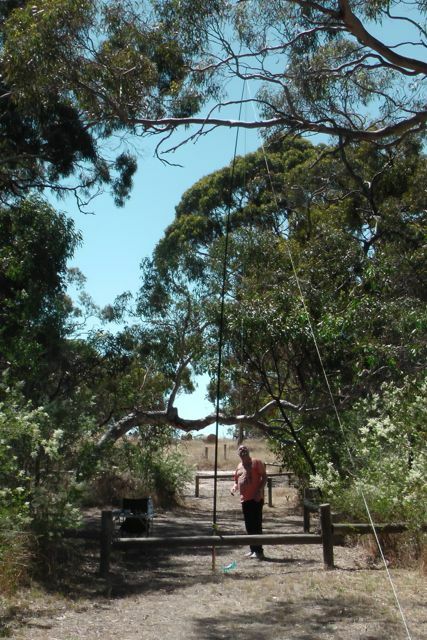 We set up on the edge of the park in a cleared area and erected the 7m squid pole and the 40m/20m linked dipole. I tuned to 7.095 and asked if the frequency was in use, only to be greeted by Larry VK5LY with a great signal. And this was followed by Graham VK5KGP, Col VK5HCF (qrp 5 watts), Tim VK5AV, and a steady flow of callers following that from VK3 & VK5. 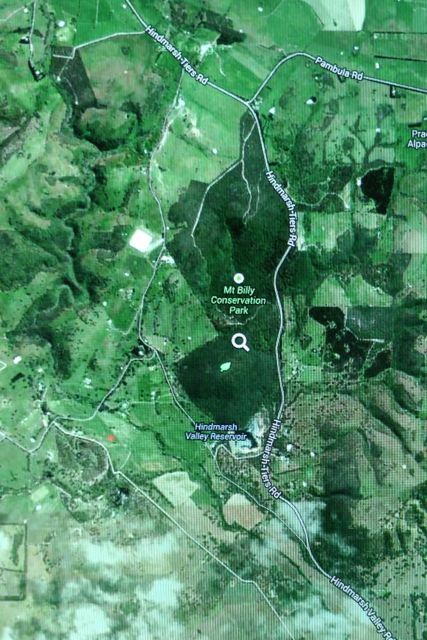 I managed a few Victorian park contacts & SOTA contacts whilst in Waitpinga CP. The first Victorian National Parks contact was with Marshall VK3MRG who was portable in Lake Eildon National Park, camping with the family. 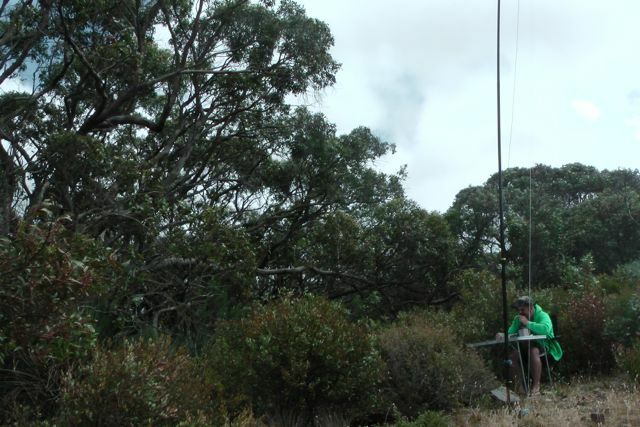 I also spoke with Glenn VK3YY was portable on SOTA peak, Trapyard Hill, VK3/ VT-005, which is located within the Alpine National Park. And then I was fortunate enough to stumble across Joe VK3YSP and Julie VK3FOWL who were portable in Cobbobonee National Park, on their extended Christmas adventure of Victorian National Parks. 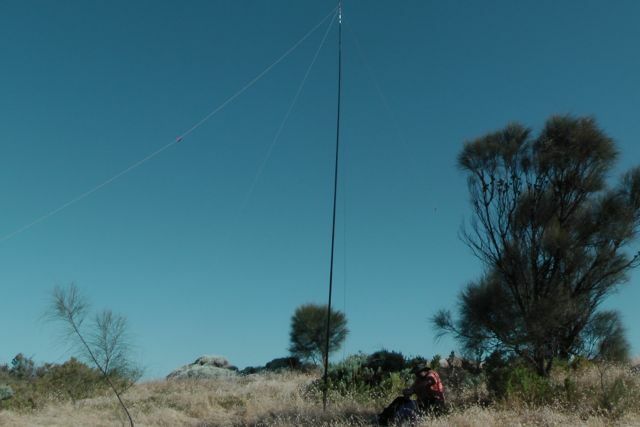 My final contact in Waitpinga CP, was with Tony VK3CAT who was portable on SOTA peak, King Billy No. 1, VK3/ VE-016. Larry VK5LY; Graham VK5KGP; Col VK5HCF; Tim VK5AV; Brian VK5FMID; Marshall VK3MRG/p; Allen VK3HRA; Tom VK5EE; John VK5TD; Nev VK5WG; Andy VK5AKH; Frank VK3GFS; John VK5FMJC; Nick VK3ANL; Shaun VK5FAKV; Bill VK5MBD; Glenn VK3YY/p; Ron VK5BRL; Dennis VK5LDM; Mal VK5MJ; Steve VK5ST; Grant VK5VGC; Craig VK3NCR/m; Joe VK3YSP/p; Julie VK3FOWL/p; Dave VK3VCE; Tom VK5FTRG; David VK5KC/p; Tony VK3CAT/p. Although Granite Island is not a Conservation Park, nor a National Park (it is a Recreation & Nature Park), I decided to have a bit of fun and do an Islands on the Air (IOTA activation) whilst I was staying at Victor Harbor. I have activated an IOTA reference before as part of the International Lighthouse & Lightship Weekend, when I travel to Kangaroo Island. But this was the first time I would be operating truly portable from an island. 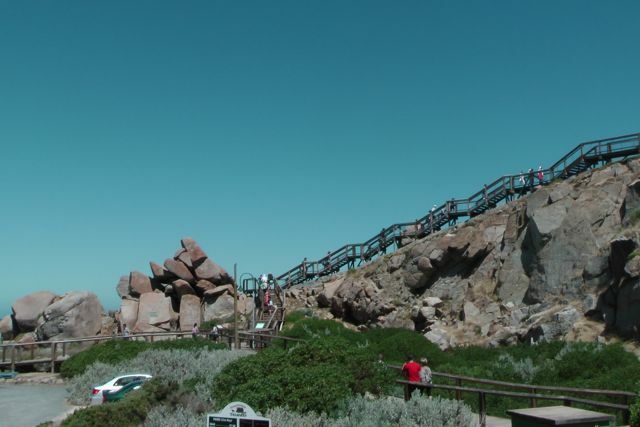 Granite Island is a Recreation & Nature Park under the control of National Parks South Australia. 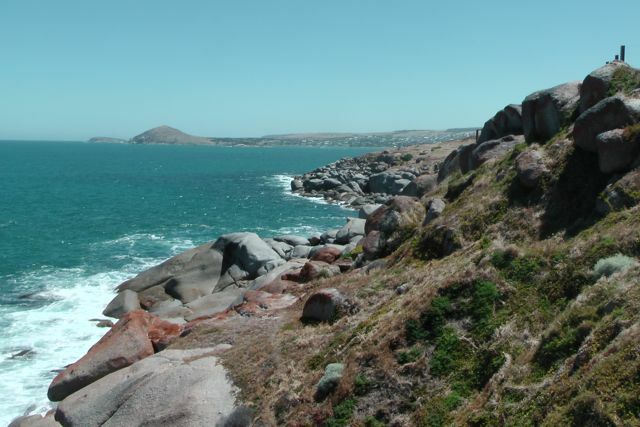 It lies just off the coast of Victor Harbor, about 100 km south of Adelaide. It is joined to the mainland by a 60 metre long wooden causeway. The island is characterised by its huge granite boulders. Many of which are coloured orange and green with lichen. I have been over to the island dozens of times as both a child and an adult. 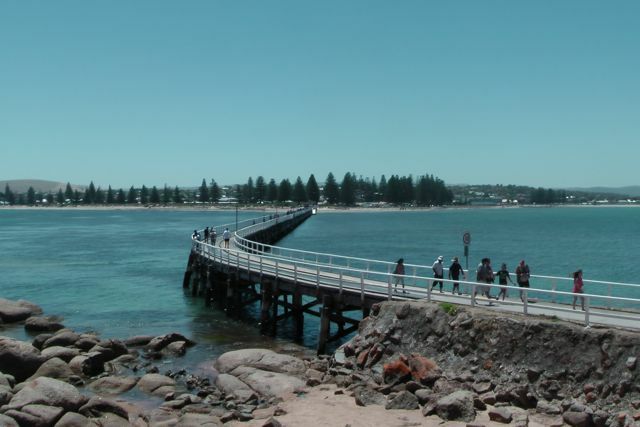 Victor Harbor is a real tourist mecca, as it is in close proximity to Adelaide. And in fact between 1986-1988 I lived and worked at Victor Harbor. It has undergone a huge amount of change since that time. 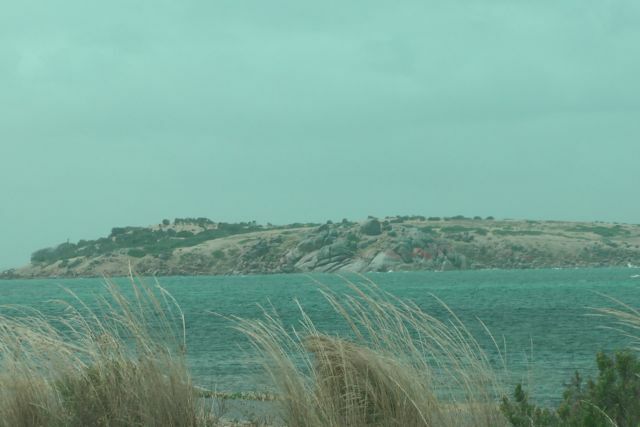 Prior to 1994, Granite Island was designated as Crown land and was managed by the local Victor Harbor District Council. In 1994 the island received a major facelift, courtesy of the Greater Granite Island Development Company. Stage one of an 11 million dollar development commenced. By January 1995, the cafe, kiosk, souvenir shop and a Penguin Centre were opened on the island. By mid 1998, the Department of Environment, Heritage and Aboriginal Affairs took control of the island. The history of this area is very interesting. 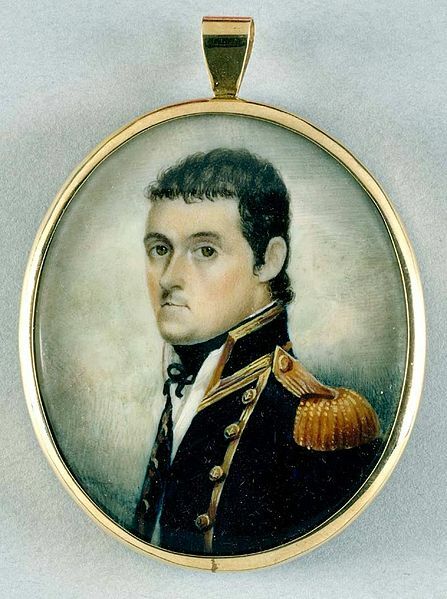 In 1802, British explorer, Matthew Flinders, met (completely by chance) with French explorer Nicholas Baudin in what is now known as Encounter Bay at Victor Harbor. England and France were war war at the time. Flinders describes in his journal, how he prepared the crew of his ship, Investigator, for action. Flinders instructed his crew to hoist a white flag of truce. Whilst on the French ship, Le Geographe, Baudin also hoped for a peaceful encounter and hoisted the French and English flags. Fortunately the chance meeting was friendly and peaceful. 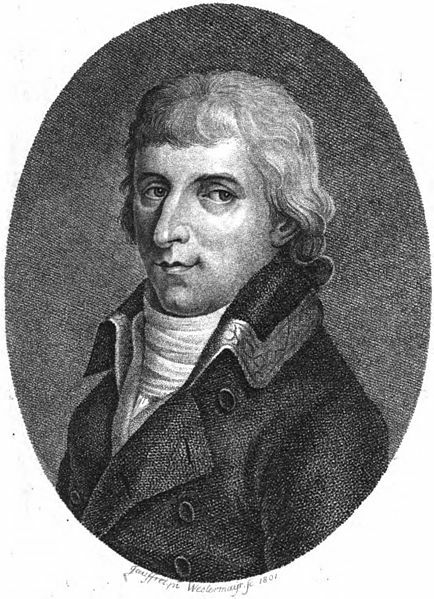 Flinders boarded the French ship and the two captains exchanged information about their explorations. They learned that they had been given the same task by their respective Governments, to chart the ‘unknown coast’ of Terra Australis. As a result of this meeting, Flinders named the area Encounter Bay. Following the meeting between Flinders and Baudin, Victor Harbor became recognised for its potential for whaling and sealing. During the early nineteenth century, Encounter Bay attracted large numbers of whales and seals, and whaling stations were established on Granite Island and the nearby Bluff (Rosetta Head) to pursue the Southern Right Whale. The local Ramindjeri aboriginal people were regarded as competent whalers and were employed as harpooners and whale spotters. The whaling industry at Victor Harbor produced whale oil, which was one of South Australia’s first exports. Encounter Bay became the most productive of the colony of South Australia’s whaling stations. However, whale numbers dramatically decreased and during the last years, whalers were only harpooning two to three whales each winter. By 872 the whale industry and ceased. 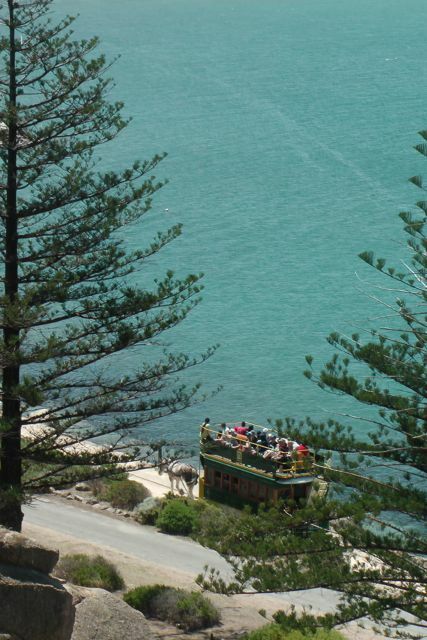 Although there were other harbours in the colony of South Australia, Victor Harbor was seen to be better than the other harbours. For one, it was conveniently located to the mighty River Murray trade. In fact there was a bid for Victor Harbor to become South Australia’s capital. This saw the construction of Granite Island’s causeway, jetties and breakwater. Sadly, Victor Harbor was unsuccessful in its bid to be the colony’s capital. Shipping thrived however, with products such as wool and wheat being ferried down the River Murray by boat, and then by steam train to Victor Harbor and across to Granite Island by the horse-drawn tram, which was then loaded onto the ships bound for ports around the world. The Granite Island causeway was constructed originally in 1864 by the South Australian Railways and was extended in 1867 to reach Granite Island. The railway across the The Causeway continued around the northern edge of Granite Island to where the jetty was constructed. It was not until 1894 that a passenger service was offered. The tramway still operates today as a tourist tram and is one of the very few horse drawn tram routes remaining in public transit service anywhere in the world. The tramway almost ceased however. From c. 1900, the horse tramway was operated by private contractors. But by the 1950’s the Cuaseway was in desperate need of repair. However a dispute between the operators and the local Council saw the Causeway reconstructed in 1954 without rail tracks. By 1956, the rail cars were disposed of, and between 1956 to 1986, a rubber tyres train provided service to the island. I remember travelling on this. In 1986, South Australia celebrated its 150th Jubilee. Prior to this, a fund was established for special projects to mark the Jubilee. Reinstatement of the horse tram was nominated as such a project, and the bid for the return of the horse tram was successful. Replica tram cars were built, tracks were relaid and on the 14th June, 1986, the horse tram service from Victor Harbor to Granite Island, recommenced. 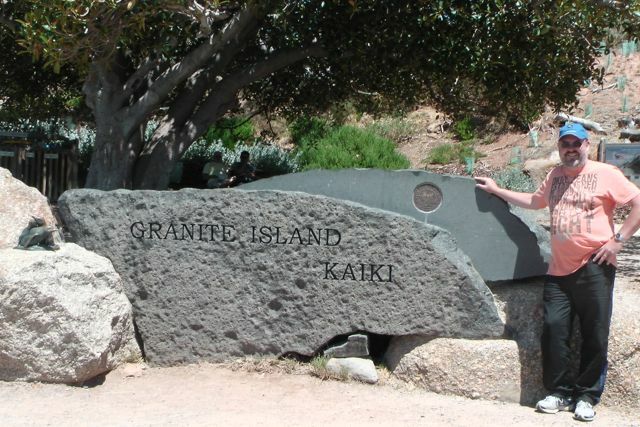 Granite Island Recreation & Nature Park is open daily between sunrise to sunset. The park is home to a colony of about 150 Little Penguins. Guided tours take place each evening at dusk. Due to recent issues with people disturbing the penguin colony, the park closes at sunset. Believe it or not, some penguins have even been beaten to death or left severely injured by vandals on the island. What possess some people, I do not know ! There are a number of walks around the island, including the interpretative Kaiki Walk where you can see some of the spectacular coastline of the island. You can also try your hand at fishing off the jetty, the breakwater or the causeway. And if it is a hot day, like it was when we visited the island, there is an assortment of cold drinks, ice cream and food at the cafe and restaurant. There is also the Penguin Centre, which unfortunately we did not get to see due to time constraints. Marija and I set up the gear right on the top of the island, overlooking Victor Harbor to our north and the Southern Ocean to our south. There was a slight breeze, but it had been a very hot day and was still warm. Our operating position was off the main tourist track, so there was plenty of room to stretch out the legs of the 20m/40m linked dipole. 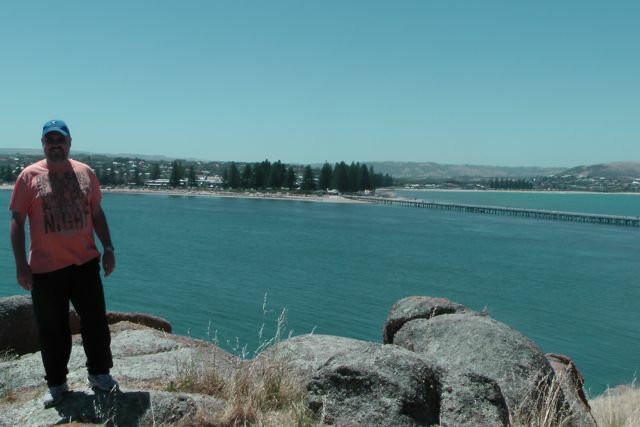 My first contact was with Graham VK5KGP who is a resident of beautiful Victor Harbor. As was to be expected, Graham was extremely strong, and almost knocked me off the top of the island. This was followed by Larry VK5LY in the Riverland, Stu VK5STU, and then Basil VK5BK. Craig VK5CE who is located at nearby Middleton then called in and was kind enough to spot me on the DX cluster. 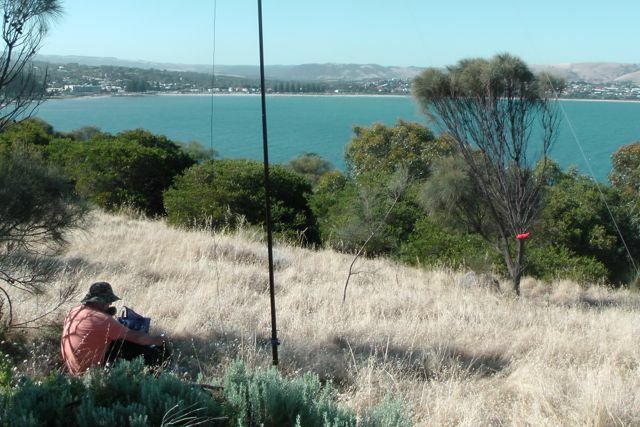 I also spoke with Andy VK5AKH and Theo VK5MTM who were operating portable at Myponga. After working 22 VK’s on 40m SSB, I decided to QSY to 20m SSB and try my luck. Craig VK5CE was my first contact and kindly spotted me again on the DX cluster. I managed to squeeze in just a few DX contacts….I1BSN, EA3NW, UA3AKO, and ZL3LF. But it was really hard going. I had to pedal really fast…..I will definitely bring the bigger Yaesu & bigger battery next time, so I can run more power ! So after a little bit of disappointment, I then went back to 40m SSB and worked Joe VK3YSP and Julie VK3FOWL who were portable in the Port Campbell National Park. They were on their Christmas trip around Victoria, activating multiple National Parks as part of the Keith Roget Memorial National Parks Award (KRMNPA) and WorldWide Flora & Fauna (WFF). I went on to work a further 15 stations in VK & ZL on 40m SSB. I was going to check into the 7.130 DX Net, but the Chinese ? Over the Horizon radar was 5/9 + and it was just not worth the heartache. After 2 & 1/2 hours in the sun, I had a total of 47 QSO’s in the log and I had pushed my luck enough with the XYL and it was approaching sunset, so it was time to pack up and head back to Victor Harbor for dinner. I made 39 contacts on 40m SSB and 8 contacts on 20m SSB. Graham VK5KGP; Larry VK5LY; Stu VK5STU; Basil VK5BK; Craig VK5CE; Nev VK5WG; John VK5DJ; Andy VK5AKH/p; Bernard VK3AMB; Theo VKMTM/p; Ian VK5CZ; Steve VK3SN; Luke VK3HJ; Brian VK5FMID; Shaun VK5FAKV; Tom VK5EE; Allen VK3HRA; Adam VK2YK/3; Frank VK3GFS; Peter VK3TQ; Nick VK2DX; Matt VK2DAG; Joe VK3YSP/p; Julie VK3FOWL/p; Tim VK5AV; Rod VK5VRB; Tom VK5FTRG; Peter VK3PAH; Graham VK5WK; Craig VK3NCR/p; James VK1DR; Peter VK5NAQ; Paul VK7CC; Marshall VK3MRG/p; Don VK7DON; David VK5DGR; Mal VK5MJ; Brian ZL2ASH; and Colin VK4FAAS. Craig VK5CE; Matt VK2DAG; I1BSN; EA3WN; UK3AKO; ZL3LF; Andy VK5AKH/p; and Mark VK6AR. 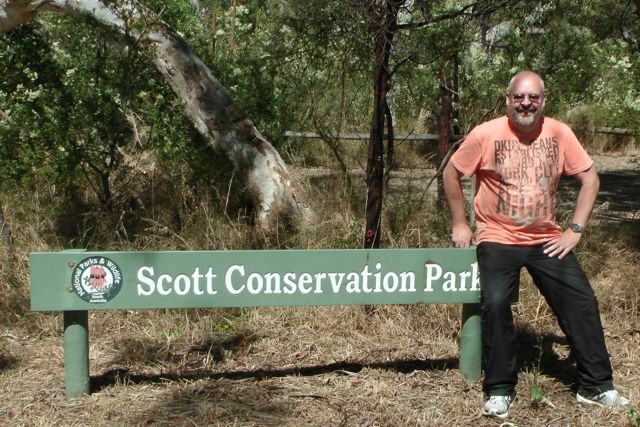 My second activation for Friday 27th December, was the Scott Conservation Park. This is located just a short distance from my first activation at the Cox Scrub Conservation Park. 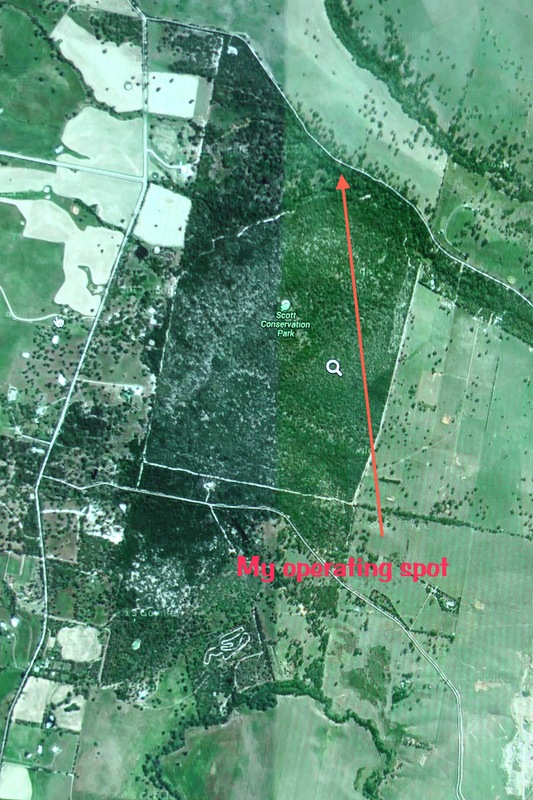 In fact it is about 4 km south, after travelling along the Bull Creek Road, and then along Deep Creek Road. 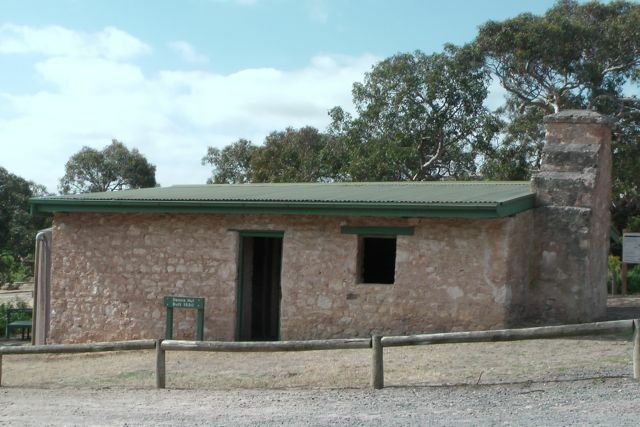 Scott Conservation Park (not to be confused with Scott Creek CP or Mount Scott CP) is located about 75 km south of Adelaide, and is 210 hectares in size. 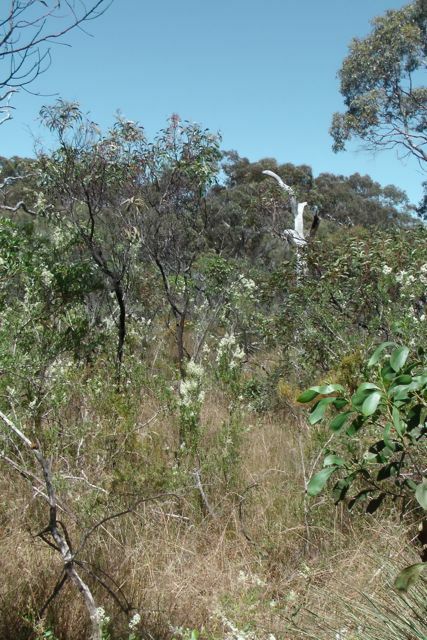 The park is relatively flat and consists of Blue and Pink gum woodlands. I could not find a lot of information on the internet on the park. It looks like it is one of those little secrets on the Fleurieu Peninsula, which might not be a bad thing. There are a number of walks in the park including the Watercourse Hike, and Orchid Hike, and they are both rated as easy. 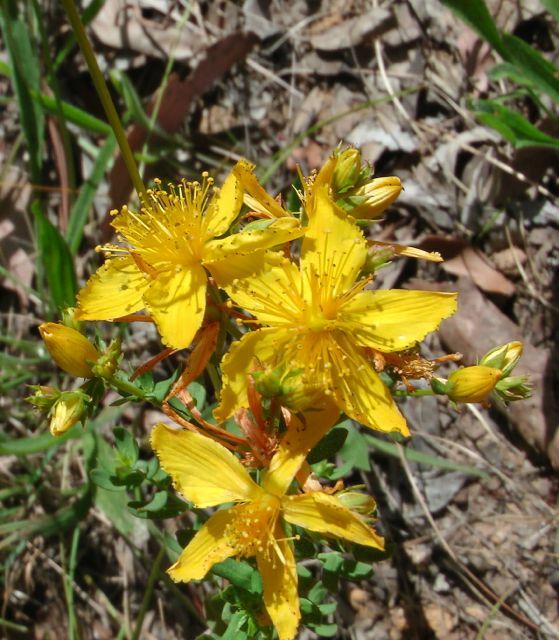 There is a wide range of vegetation within the park and there were many of the native plants in flower during our visit. The park consists of forest, woodland, and heathland. The park contains a wide variety of animals including Western Grey kangaroos, Ringtail Possums, and Western Pygmy-possums. 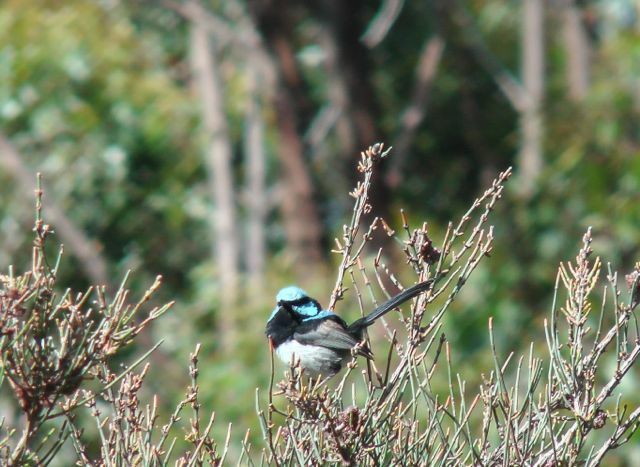 A huge amount of bird life is also found in the park including the endangered Chestnut-rumped Heathwren and Diamond Firetail. Marija and I found a carpark (gate 1) on Gould Road, and set up the equipment there. It was a nice shaded area out of the very hot sun. There was also a convenient fire track/break, which allowed me to run out the legs of the 40m/20m linked dipole and a permapine post/railing to attach the squid pole to. After switching on the FT-817nd to 40m, I heard Ian VK1DI/2 on SOTA peak VK2/ SE-049, calling CQ. So I gave Ian a call and he was my first contact in Scott CP. I then moved to 7.095 and called CQ and was soon Hunted by Brian VK5FMID, followed by keen Park Hunter Larry VK5LY and then Graham VK5KGP. A steady flow of callers followed from VK3 & VK5. After things had slowed down on 40m, I changed bands to 20m. The 20m band was really quite, with very little activity. I did hear few Latin American stations but their signal strengths were well down. I tried calling CQ on 14.330 on 20m, but there were no takers. So it was time to pack up the gear again and head off to Victor Harbor.